"These two defendants, Gitlow and Larkin, are beyond doubt two of the prominent leaders in this revolutionary scheme. They are men of intelligence, with considerable experience in public affairs, and all this either from honest fanaticism or muddled thought they have perverted into the most dangerous channels. As they stand to-day, as against the organized government specified in the statute, they are positively dangerous men." Chief City Magistrate William McAdoo of New York holding Benjamin Gitlow and James Larkin for the grand jury on criminal anarchy charges. "He would make America a Red Ruby in the Red Treasure Chest of the Red Terror." Assistant District Attorney Alexander I. Rorke describing the threat posed by Benjamin Gitlow. "Is anybody afraid of revolution? For a man to be afraid of revolution in America would be to be ashamed of your mother. Nothing else. Revolution? There is not a drop of honest blood in a single man that does not look back to some revolution for which he would thank his God that those who revolted won. None of you. Take the revolutions out of Great Britain, and what is left. Take them out of France and you would have the absolute despotism with the people as slaves. What of our own country? We are 150 years old or thereabouts, and we now speak about revolution as if we were speaking of cutting a man's throat, a nation born in it, born in it!" Clarence Darrow's closing argument in defense of Benjamin Gitlow. New York City Chief Magistrate William McAdoo's decision to bind Gitlow and Larkin over to the grand jury for violating New York's criminal anarchy statute. Benjamin Gitlow appealed his conviction for violation of New York's criminal anarchy statute (Penal Law, sections 160 and 161). Gitlow argued that he was entitled to a certificate that there was a reasonable doubt whether the judgment of conviction against him should stand because the indictment failed to set forth such facts as would be sufficient to bring him within the prescribed definitions given to this class of crime under Section 160. The court denied the motion for a certificate of reasonable doubt. Benjamin Gitlow appealed his conviction for the crime of criminal anarchy, and also from orders denying his motions to set aside the verdict and in arrest of judgment. The court upheld Gitlow's conviction. The Court of Appeals of New York, the state's highest court, upheld Gitlow's conviction. The court ruled that Penal Law, sections 160, 161, making it a felony to advocate criminal anarchy, defined as the doctrine that organized government should be overthrown by force or violence, assassination, etc., do not violate the First Amendment of the Constitution or Art. 1, sec. 8 of the New York Constitution. relative to freedom of speech and of the press. Judge Pound wrote a dissenting opinion which was joined by Judge Cardozo. The United States Supreme Court affirmed Benjamin Gitlow's conviction of the statutory crime of criminal anarchy. Justice Holmes wrote a dissenting opinion which Justice Brandeis joined. Benjamin Gitlow was convicted of violating sections 160 & 161. Several references are made to Benjamin Gitlow. Hearings held on February 4 & 6, 1920 to discuss several sedition bills. Among those testifying were Attorney General of the United States Mitchell Palmer, New York Attorney General Charles D. Newton and Samuel Gompers, president of the American Federation of Labor. The Gitlow and Larkin case was discussed. Attorney General Newton testified: "Yesterday, we obtained the conviction of Benjamin Gitlow, who was a former member of the Assembly of New York; he was elected on the socialist ticket and had become a communist; and he published the manifesto of the Communist Party. He was well defended, I have no doubt, no less a personage defending him than Clarence Darrow." (p. 140). Chapter from the Lusk Committee Report that contains references to Benjamin Gitlow and James Larkin. The New York State Legislature established the Joint Legislative Committee to Investigate Seditious Activities pursuant to Concurrent Resolution, March 26, 1919. 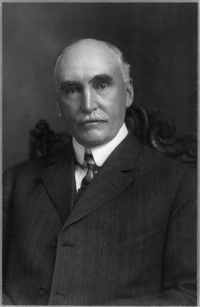 The committee was headed by Senator Clayton R. Lusk. 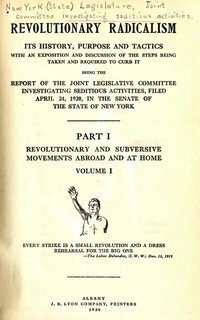 This committee was given broad authority to investigate individuals and organizations in New York who were suspected of promoting the overthrow of the United States government in violation of the criminal anarchy articles of New York's Penal Code. New York enacted these criminal anarchy statutes in 1902 in response to the assassination of President McKinley by Leon Czolgosz an anarchist in Buffalo New York in 1901. President McKinley was shot on September 6, 1901 and died on September 14, 1901. Except for a previous minor case, this large scale investigation by the Lusk Committee was the first time that the criminal anarchy statutes had been used to prosecute anyone since their enactment in 1902. The Lusk Committee spent over a year gathering extensive information on suspected radical groups using forceful investigative techniques such as raiding the offices of suspected organizations, examining documents and infiltrating meetings. The Committee also assisting law enforcement agents in the arrest of thousands of suspects, and subpoenaing witnesses for the Committee hearings. A number of individuals including Benjamin Gitlow and James Larkin were convicted of violating the criminal anarchy statues. The Committee's investigation officially ended in April 1920 when it submitted its final report to the legislature. Short reference to Clarence Darrow from volume II of the Lusk Committee report. The reference begins at the bottom of page one and ends on the top of page 2 of this excerpt. Volume II of the Lusk Committee report. Volume III of the Lusk Committee report. Volume IV of the Lusk Committee report. 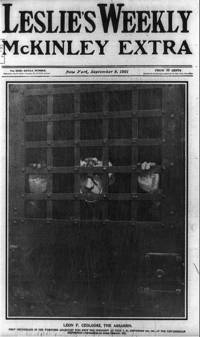 Article about New York's Criminal Anarchy Act that Benjamin Gitlow was convicted for violating. Brief description of the Gitlow case in the Yale Law Review. Article by Professor Mackey published in New York University Law Review. Discusses the importance of the Gitlow case and reproduces the opinion written by New York City Chief Magistrate William McAdoo. The title comes from a statement about Gitlow by Prosecutor Rorke who said that "He would make America a Red Ruby in the Red Treasure Chest of the Red Terror." Also contains an excerpt of Clarence Darrow's address to the jury, Judge Weeks thanks to the jury for its guilty verdict, and a short article entitled "Communism on Trial" by Arturo Giovanitti. It was published by the Communist Labor Party. Benjamin Gitlow was convicted of "criminal anarchy" for publishing the Left Wing Manifesto because it called for revolution. His conviction was based on New York's criminal anarchy statute. Published in The Revolutionary Age [New York], v. 1, no. 5 (Jan. 1, 1930), pg. 9. Unsigned article, attributed to editor Ben Gitlow. Book written when McAdoo was the Police Commissioner of New York City from 1904-06. Book about James Larkin and a major industrial dispute between approximately 20,000 workers and 300 employers in Dublin Ireland from August 1913 to January 1914. The dispute is often referred to as the Dublin Lockout. James Larkin was the main leader of the union workers. Larkin's views of socialism, republicanism, and trade unionism became known as "Larkinism." Published in "State Service: An Illustrated Monthly Magazine Devoted to the Government of the State of New York and Its Affairs." A report published by the Legislative Committee of the People's Freedom Union which is very critical of the Lusk Committee. Gitlow case is briefly discussed on page 31. 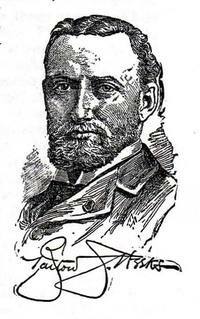 Short bio of Bartow Sumpter Weeks, the presiding judge in Gitlow's trial. Benjamin Gitlow was born December 22, 1891 to Russian immigrant parents in Elizabethport, N.J. His father, Lewis Albert Gitlow, had emigrated to the United States in 1888, and his mother, Kate, in 1899. Gitlow joined the Socialist Party in 1909. Later he became a member of the more radical Left Wing faction of the Socialist Party. In 1918, that faction was expelled from Socialist Party. Later Gitlow, John Reed, and James Larkin established the Communist Labor Party. Trial judge in Benjamin Gitlow's trial. "The manifesto itself declares that this is the golden opportunity of the red revolutionists. Is this not a call to action for those who are sworn to uphold the laws of their country? Are we, who are the ministers of the law, to ignore this challenge? Are we to lose ourselves in legal subtleties and nice disquisitions and historical references, and bury our heads in clouds of rhetoric about liberty of speech? Liberty of speech! It is the very breath and soul of every American; it is the essence of our republicanism and we guard it with such jealousy that we have hitherto tolerated its abuse into a license which now threatens our institutions. Are there no limits to liberty of speech? Can these men openly state that they intend to destroy the state, murder whole classes of citizens, rob them of their property, and then escape under the plea of liberty of speech?" Attorney General Newton resurrected New York's Criminal Anarchy Act to use it against radicals like Benjamin Gitlow and James Larkin. This law was enacted in 1902 in response to the assassination of President William McKinley by a professed anarchist, Leon Frank Czolgosz. Czolgosz shot McKinley at the Pan-American Exposition in Buffalo on September 6, 1901. McKinley died eight days later. The New York law was only used once prior to 1919 in a relatively minor case. Photo from "State Service: An Illustrated Monthly Magazine Devoted to the Government of the State of New York and Its Affairs" by James Malcolm (1918). 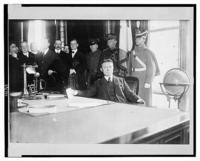 In 1919, the New York State Legislature established the Joint Legislative Committee to Investigate Seditious Activities. The committee consisted of four senators and five assemblymen and was headed by Senator Clayton R. Lusk so it became known as the "Lusk Committee." 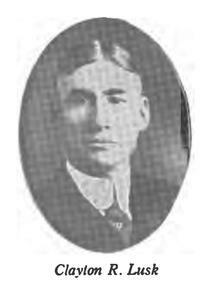 Lusk was a 1902 graduate of Cornell Law School and had only been in the legislature for two months. The Lusk Committee was granted broad power to investigate suspected radical organizations. 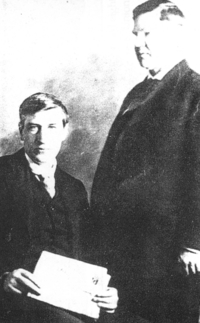 Benjamin Gitlow and James Larkin were arrested during a Lusk Committee investigation. Photo from "State Service: An Illustrated Monthly Magazine Devoted to the Government of the State of New York and Its Affairs" published in 1918. 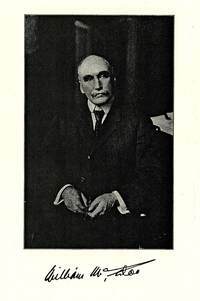 Benjamin Gitlow's mug shot in the Lusk Committee report formally titled "Revolutionary Radicalism: Its History, Purpose and Tactics with an Exposition and Discussion of the Steps Being Taken and Required to Curb It" (Volume I) (April 1920). Cover from pamphlet containing Benjamin Gitlow's address to the jury and excerpts from Clarence Darrow's address to the jury. 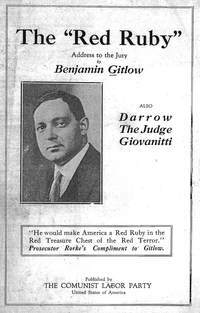 Prosecutor Rorke had said that Gitlow "would make America a Red Ruby in the Red Treasure Chest of the Red Terror." The full text of the pamphlet is available above. It was published by the Communist Labor Party. James Larkin was arrested with Benjamin Gitlow. Larkin was also convicted and sentenced to Sing Sing prison. Larkin was an Irish trade union leader and socialist activist. He was born to Irish parents in Liverpool, England in 1875. 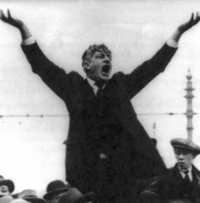 James Larkin Addressing a Crowd c. 1923. 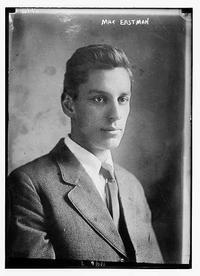 Max Eastman wrote the forward for Benjamin Gitlow's autobiography "I Confess: The Truth about American Communism." Library of Congress Prints and Photographs Division, LC-DIG-ggbain-05770. Sing Sing Correctional Facility is maximum security prison in Ossining, New York. Both Benjamin Gitlow and James Larkin were sentenced to Sing Sing. 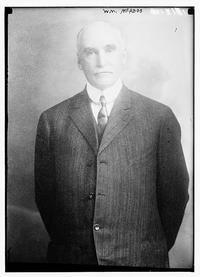 On January 1, 1920, Lewis E. Lawes became warden, a position he held the next twenty-one years, instituting reforms. A noted prison reformer, Lawes was a friend of Clarence Darrow. Lawes most well known book is Twenty Thousand Years in Sing Sing. 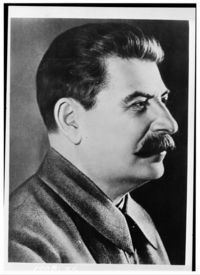 In 1929, Soviet leader Joseph Stalin expelled Benjamin Gitlow from the Communist Party after Gitlow openly defied him. This led Gitlow, Jay Lovestone, Bertram Wolfe, and others, to organize the Communist Party, USA. 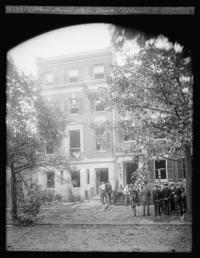 Library of Congress Prints and Photographs Division, LC-USW33-019081-C. The United States Supreme Court affirmed Benjamin Gitlow's conviction for criminal anarchy in Gitlow v. People of State of New York, 268 U.S. 652 (1925). 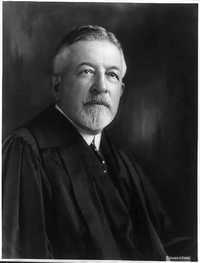 Justice Sanford wrote the majority opinion. Library of Congress Prints and Photographs Division, LC-USZ62-62206. 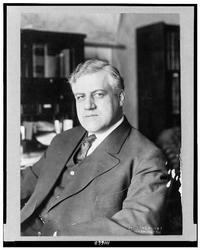 Alexander M. Palmer (1872 - 1936) was the Attorney General of the United States from 1919 to 1921. During his closing argument to the jury in the Gitlow trial Clarence Darrow quoted Abraham Lincoln's first inaugural address "This country, with its institutions, belongs to the people who inhabit it. Whenever they shall grow weary of the existing government, they can exercise their constitutional right to amend it, or their revolutionary right to dismember or overthrow it." Darrow told the jury "This was Lincoln. If Lincoln would have been here today, Mr. Palmer, the Attorney-General of the United States, would send his night-riders to invade his office and the privacy of his home and send him to jail." After the Gitlow trial, on May 3, 1920 Darrow spoke at a convention of the International Ladies' Garment Workers' Union in Chicago. Darrow denounced Attorney General Alexander Mitchell Palmer for trying to discredit organized labor by issuing reports such as his "May Day scare, which had no foundation in fact." 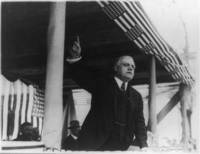 Palmer had predicted that Communists would try to overthrow the United States government on May Day 1920. Palmer issued his prediction because the previous year a series of bombings had been perpetrated by sending bombs through the U.S. mail to be delivered on May Day 1919. Palmer's prediction led to the mobilization of the National Guard and the New York City Police Department. 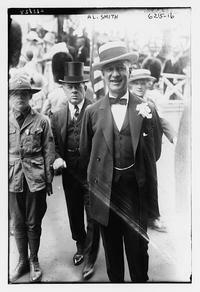 Palmer was ridiculed when May Day 1920 passed without the predicted violence. Palmer was understandably worried about potential bombings because on June 2, 1919, several bombs were detonated by anarchists in eight American cities. One of the bombs seriously damaged Palmer's own home. Benjamin Gitlow and James Larkin were arrested, tried and convicted for violating New York's Criminal Anarchy Act. This law was enacted in 1902 in response to the assassination of President William McKinley by a professed anarchist, Leon Frank Czolgosz. Czolgosz shot McKinley at the Pan-American Exposition in Buffalo on September 6, 1901. McKinley died eight days later on September 14, 1901. Czolgosz was tried and convicted of murder and executed by electric chair at Auburn Prison on October 29, 1901. Reproduction of first photograph of Leon F. Czolgosz, the assassin of President William McKinley, in jail. Library of Congress, LC-USZ62-99204. Arturo M. Giovannitti (1884 - 1959) was an Italian immigrant, union leader, anarchist, socialist and poet. 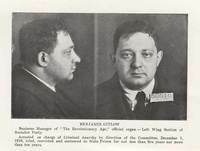 The Lusk Committee referred to Giovannitti as "an extreme radical with marked anarchistic tendencies . . . ." Giovannitti observed the Gitlow trial and later wrote about it and praised Clarence Darrow's closing argument. 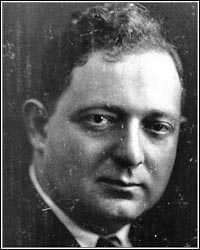 Joseph James Ettor (1886 - 1948) was an Italian-American trade union organizer. During the Lawrence textile strike (often called the Bread and Roses strike), in Lawrence, Massachusetts in 1912 a woman striker named Anna LoPizzo, was killed as police broke up a picket line. Joseph Caruso, a striker, was charged with her murder. Giovannitti and Ettor, who were not present, were arrested and charged as accessories to murder. The strikers accused the police of shooting LoPizzo. All three were acquitted. Library of Congress Prints and Photographs Division, LC-DIG-ggbain-07339. Charles Seymour Whitman served as Republican Governor of New York from January 1915 to December 1918. In 1920 Charles Whitman argued on behalf of Gitlow for a certificate of reasonable doubt after Gitlow was convicted that would let him out on bail pending an appeal. Whitman based the plea on the admission of improper evidence and damaging statements by Assistant District Attorney Rorke. But the certificate was denied and Gitlow was sent straight to Sing Sing prison. Library of Congress Prints and Photographs Division, LC-USZ62-132769. From volume one of the Lusk report. From "The 'Red Ruby' Address to the Jury by Benjamin Gitlow" published by The Communist Labor Party of the United States. Cover from Volume 1 of the Lusk Committee Report. Full-text available above. 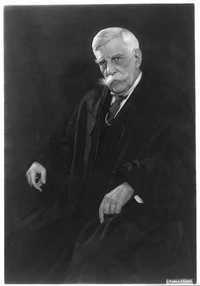 Justice Oliver Wendell Holmes (1841 - 1935) wrote a famous dissent in Gitlow v. New York, 268 U.S. 652 (1925) in which Justice Louis D. Brandeis concurred: "If what I think the correct test is applied it is manifest that there was no present danger of an attempt to overthrow the government by force on the part of the admittedly small minority who shared the defendant's views. It is said that this manifesto was more than a theory, that it was an incitement. Every idea is an incitement. It offers itself for belief and if believed it is acted on unless some other belief outweighs it or some failure of energy stifles the movement at its birth. The only difference between the expression of an opinion and an incitement in the narrower sense is the speaker's enthusiasm for the result. Eloquence may set fire to reason. But whatever may be thought of the redundant discourse before us it had no chance of starting a present conflagration. If in the long run the beliefs expressed in proletarian dictatorship are destined to be accepted by the dominant forces of the community, the only meaning of free speech is that they should be given their chance and have their way."